Blondies are good enough on their own, but add peanut butter? Now they’re a fan-favorite. 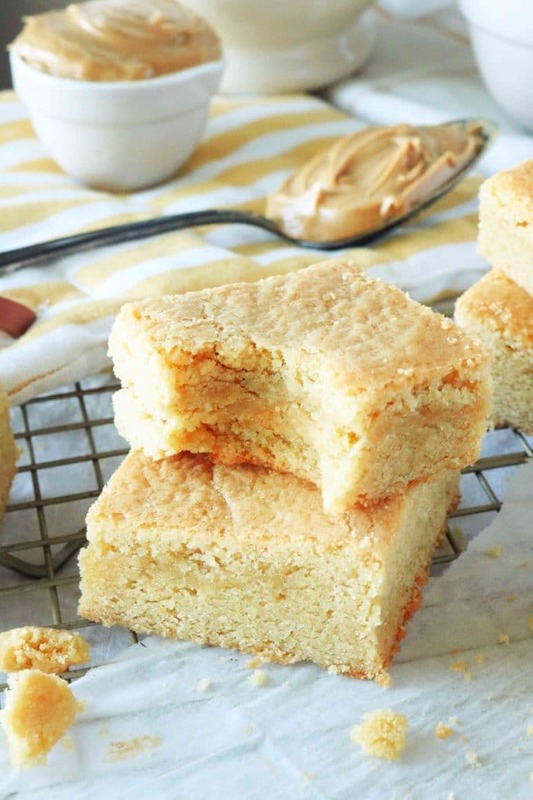 Peanut Butter Blondies are a salty-sweet dessert to savor with every single bite. Sink your teeth into one of these for peanut buttery, melt in your mouth bar cookie. You’ll find these Peanut Butter Blondies are just as divine hot out of the oven alongside an ice-cold glass of milk, yet just as wonderful served at room temperature and stacked a mile-high at your next potluck party. 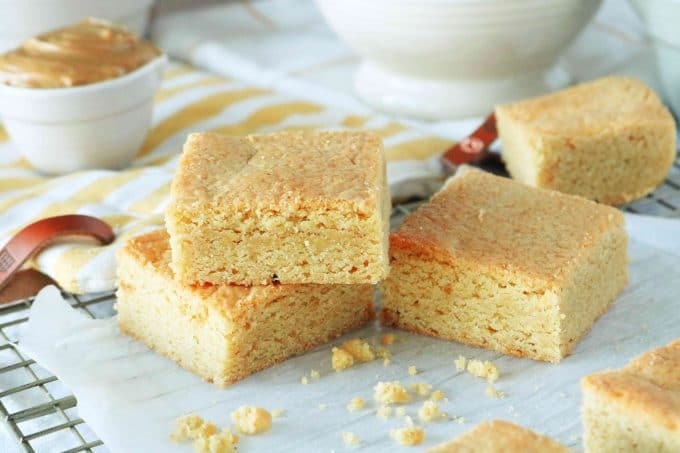 Blondies are the vanilla cousin of the brownie, and the two bars come together exactly the same, with almost the same ingredients. The only true differences between the blondie and the brownie are (1) the brownie contains either cocoa powder or melted chocolate (whereas the blondie does not), and (2) often times, you’ll find the blondie has a slightly chewier texture than a brownie. So, if blondies are the vanilla cousin of the brownie, then Peanut Butter Blondies are the peanut butter cousin of the blondie. Can you guess which cousin is the family favorite? USE REGULAR, CREAMY PEANUT BUTTER! When it comes to differentiating a standard blondie from a Peanut Butter Blondie, only one true difference arises, and I’m sure you can guess what it is. It’s peanut butter. And, not the sugar-free, healthy kind either — just good ol’ fashioned, creamy peanut butter. You’ll notice in the above ingredient list, the butter is both melted and unsalted. Unsalted butter gives you more control over the salt content and flavor in baked goods. 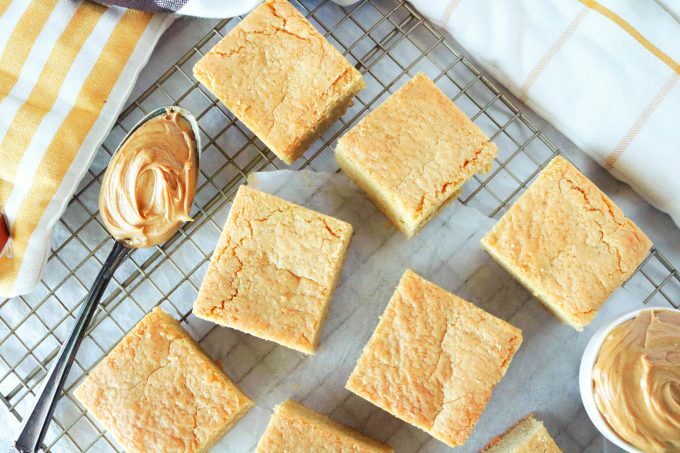 If you were to substitute salted butter for this recipe, your Peanut Butter Blondies would turn out far too salty. Be sure to read the labels when picking out your butter from the dairy aisle. Most bar cookie recipes will call for melted butter as it lends itself well to a dense and chewy texture, which is exactly what you should expect from a bar cookie, and more specifically, these Peanut Butter Blondies. You may be wondering why this recipe calls for two types of sugar: Granulated and brown sugar. Brown sugar helps to add a chewy texture to baked goods. A balance of the two in a cookie recipe will assist in yielding the perfect, thick and chewy bite. AN EGG AND A YOLK…WHAT GIVES?! Ok, what gives, right? As fun as toggling eggs might be to some, others might feel a little put off by that extra yolk in the recipe. So, if you want to know what that egg yolk is giving to your recipe, it’s richness. That one little yolk will add a serious amount of richness to your Peanut Butter Blondies, and you’ll find the end-result well-worth a 30-second back and forth. Bar cookies are amongst the easiest and fastest desserts to make. They come together quickly, and contrary to cookies, there is no scooping or rolling necessary. Extra bonus. Just a simple mix of the batter and a small stint in the oven is all it takes, and before you know it, it’s time to cut into your new favorite dessert — Peanut Butter Blondies. Add dry ingredients to wet, and combine. Transfer to square pan and bake. The first step of most baking recipes will be to mix the dry ingredients. This is because once the sugar and eggs come together, chemical reactions start to take place. Did you know, that if you leave sugar and eggs mixed for too long, it can actually cause baked goods to taste burnt…without even burning them in the oven?! Moral of the story, get your dry ingredients out of the way first. Mix together the all-purpose flour, baking powder, and sea salt. Then, set aside, and get started on your wet ingredients. 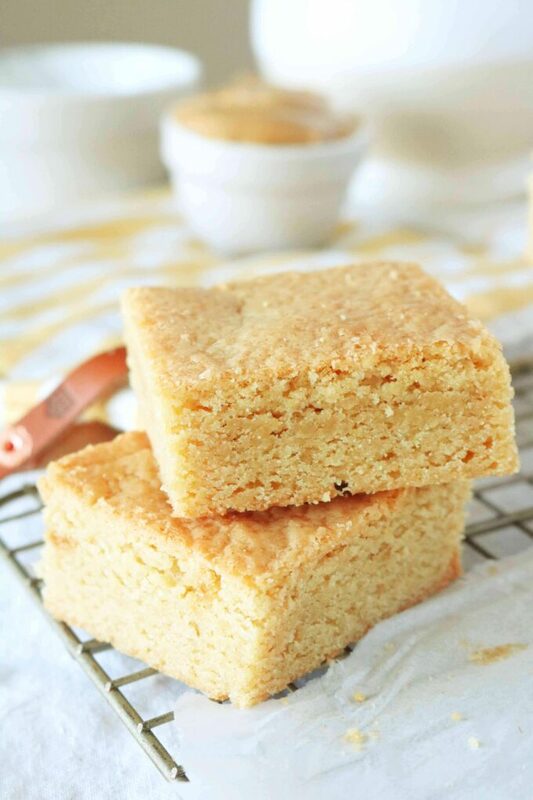 The wet ingredients for your blondies consist of melted butter, granulated sugar, brown sugar, an egg and egg yolk, vanilla extract, and of course, peanut butter. There’s no special tactic needed here. Just combine it all together in a large mixing bowl until it looks nice and smooth. Using a whisk for this task makes quick and easy work. The dry ingredients will go into the wet ingredients and you’ll stir until just combined. Take care not to overmix the batter, and you’ll be granted a perfectly soft and tender Peanut Butter Blondie. Lastly, transfer the blondie batter to a prepared 8×8″ baking dish. Take note, the size of the baking dish matters because the depth of the batter matters, and will affect both bake time and doneness. So, make sure you’ve got the right-sized pan, grease it, add the batter to it, and smooth over the top if necessary. Then, pop it in a 350° and bake for 25 minutes. After the 25 minute marker, slide a layer of aluminum foil across the top of the pan, and bake for 10 more minutes. This will help your blondies from over-browning on the top. If you prefer your blondies “less done”, shave about 5 minutes off of the cook time. You’ll have to allow them longer cooling period so they have time to set up, but they will be ooey-gooey, peanut buttery delicious by the time you cut into them. Once your Peanut Butter Blondies have baked and cooled, you can store them in an airtight container at room temperature and they will stay fresh for 3-4 days. If you’d like to preserve your bars farther out than this, simply place them in a snug, freezer-safe, airtight container (or freezer-safe, zip-top baggie) for up to 2 months. 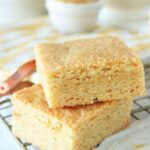 Snickerdoodle Blondies are buttery and soft, with a top dressing of cinnamon-sugar. Butter Pecan Blondies are rich and nutty, made extra decadent with brown butter, and topped off with a Maple Cream Cheese Frosting. Egg Hunt Blondies are the most adorable blondies you’ve ever seen topped with buttercream icing and M&M candies. Plus, an easy trick to make the frosting look like grass for an Easter egg hunt topping! Peanut Butter Rice Krispie Treats are a gooey, soft and stretchy childhood favorite revamped with big peanut butter flavor! Preheat the oven to 350° and have ready a greased, square (8x8”) baking dish. In a small mixing bowl, whisk together flour, sea salt, and baking powder. Set aside. 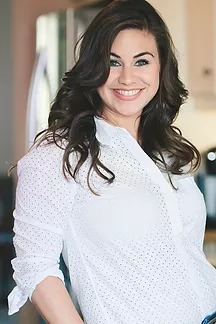 Add melted butter, granulated sugar, brown sugar, peanut butter, egg, yolk, and vanilla to a large mixing bowl and whisk or stir to completely combine. Then, stir in the dry ingredients. Add the batter to the prepared dish, and smooth over the top. Bake for 25 minutes. Cover with aluminum foil and bake 10 minutes more. Remove from the oven and allow to cool slightly before cutting. For a "less done" blondie, pull from the oven after 28-30 minutes, and allow to cool completely before cutting. This is like the ultimate guide to dessert bars and I love it! You give so many tips and tricks that just about anyone can bake these right! They look like the perfect after school snack for my kids! These look so chewy and perfect!! OH! I can’t wait to try these! We love brownies … blondies are a close second. I think it’s the texture … but add peanut butter – oh yeah! Kelly as soon as I opened the page your one of the chicken recipe video was on. You were looking so beautiful girl. Now for these peanut butter blondies, I fell in love now. I am gonna make a wheat or oats version with them. Making bookmark. That is SO nice 🙂 Thank you so much, Bhawana!!! Enjoy your blondies! Well I know I would love one of these with my afternoon latte. 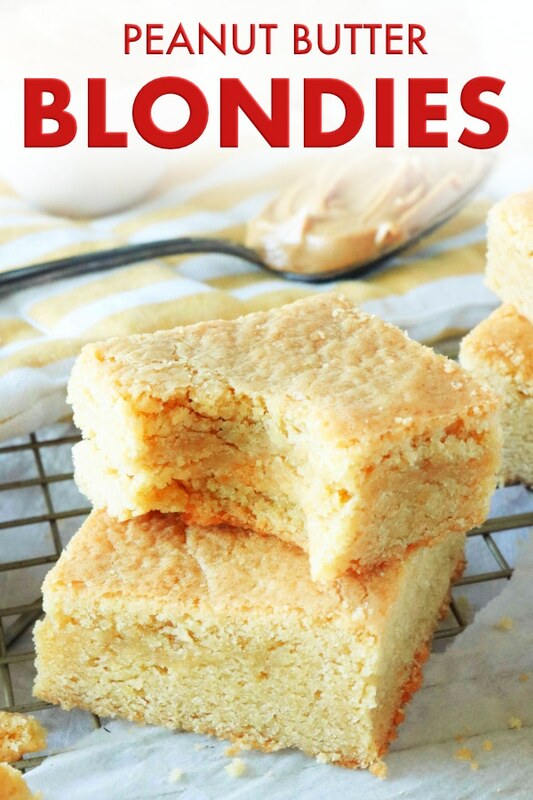 I happen to really like blondies….a nice change of pace from chocolate desserts. Great to take along to a pot luck too.